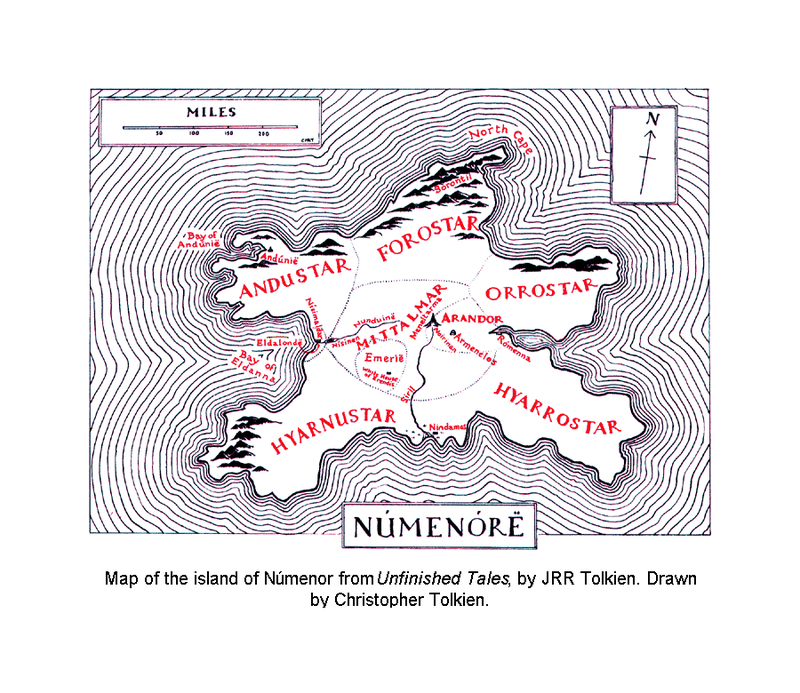 Location: The great island raised by the Valar for the Edain, upon which they founded the realm of Númenor. As a reward for their sufferings in the cause against Morgoth, the Valar, the Guardians of the World, granted to the Edain a land to dwell in, removed from the dangers of Middle-earth. Most of them, therefore, set sail over Sea, and guided by the Star of Eärendil came to the great Isle of Elenna, westernmost of all Mortal lands. Then they went up out of the sea and found a country fair and fruitful, and they were glad. And they called that land Elenna, which is Starwards; but also Anadûnë, which is Westernesse, Númenórë in the High Eldarin tongue. There they founded the realm of Númenor. 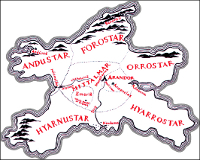 The star-like shape of Elenna, the island of Númenor. The whole land of Númenor was so posed as if it had been thrust upward out of the sea, but tilted southward and a little eastward; and save upon the south the land in nearly all places fell towards the sea in steep cliffs.